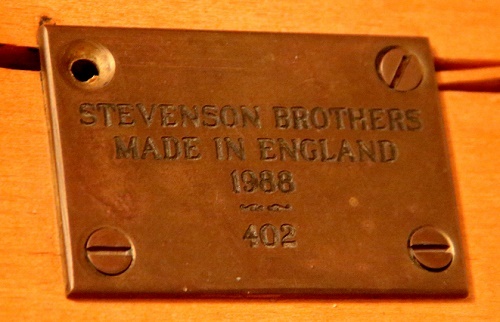 Stevenson Brothers is a fine name in hand carved rocking horses. The two brothers began making them in the 1980s and are still at it today in England. Most Stevenson Brothers rocking horses are mounted on a glider, but this one (as you can see) is on a nice large bow rocker. We're not sure how many of these were made but this one is number 402 and made in 1988, as noted on the plaque. 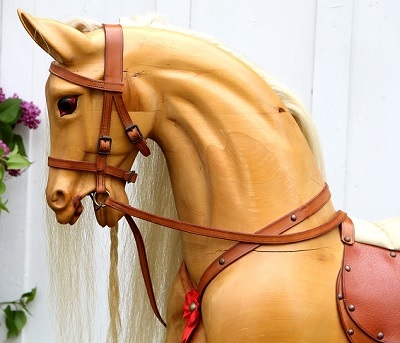 It doesn't appear Stevenson Brothers makes this kind with bow rockers any longer, but when asked Stevenson Brothers said that this style of rocking horse goes for 2800 Euro (find the current exchange rate to US dollars by searching "euro"). 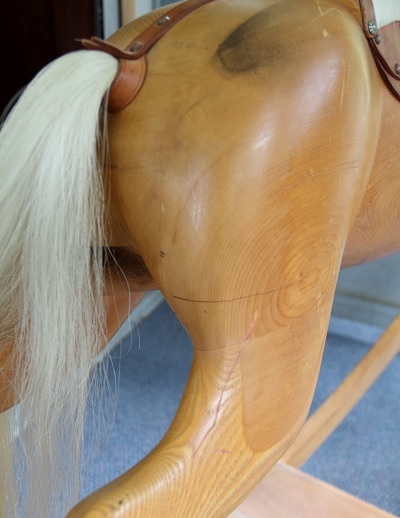 The asking price is due to the crack above the shoulder, a crack on the rear leg and a crack in the rocker where the plaque is located (all defects and details are clearly visible in the images). 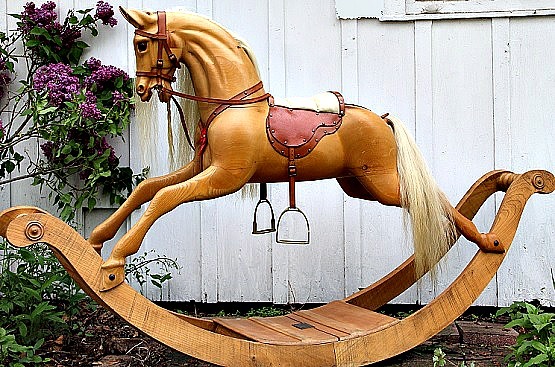 But this rocking horse still looks, rocks and rides just fine! It takes up residence near central Iowa - perhaps you can come pick it up and save money on the shipping. 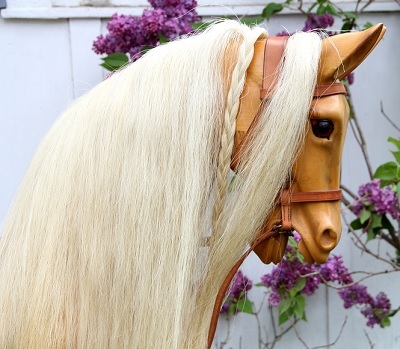 "This strong, beautiful stallion is named Sham, after my mother's favorite childhood novel King of the Wind. She loved horses and collected rocking horses. We were not allowed to ride Sham until we were old enough to take care of him; he was too precious. Sham will be a great addition to your stable. He is very strong, sturdy, and rides like the wind!"